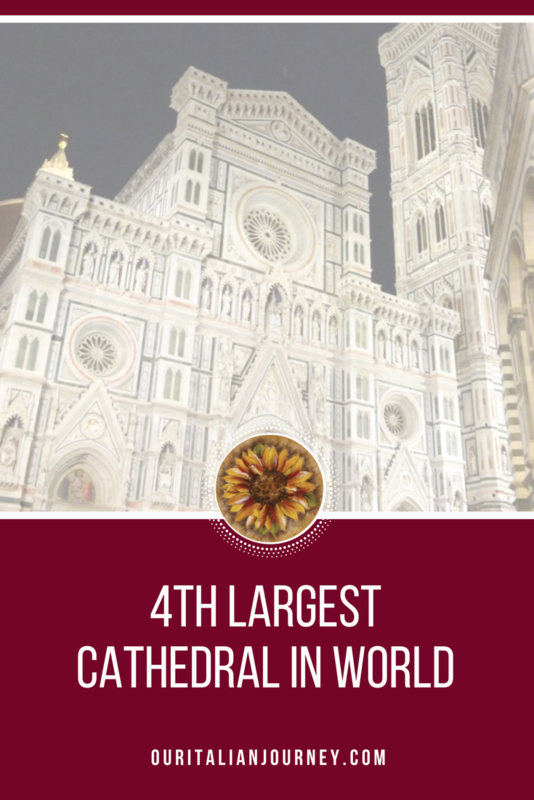 The 4th largest cathedral in the world is located in Florence Italy. 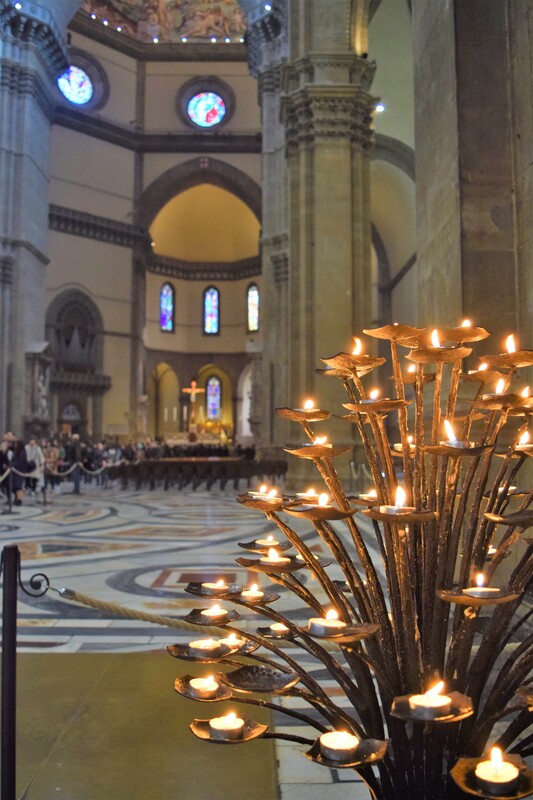 Florence’s cathedral is the fourth largest in the world after Saint Peter’s (Rome), Saint Paul’s (London), and the Duomo in Milan (Italy). 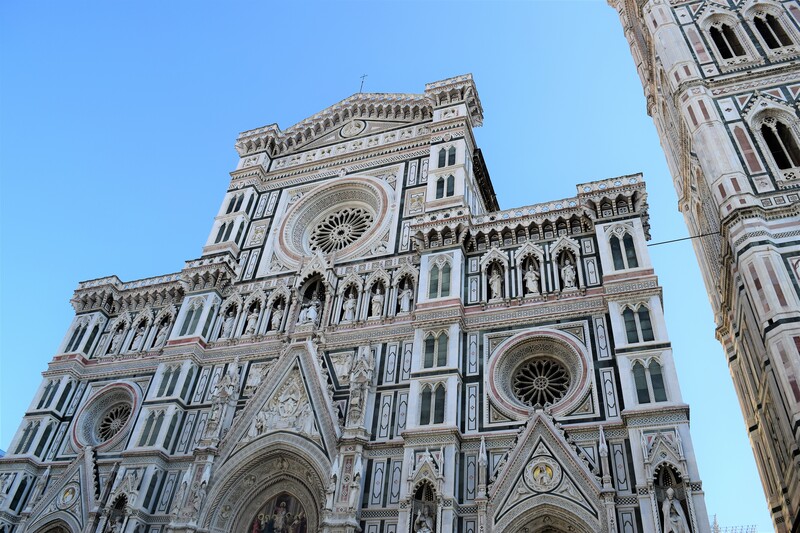 The cathedral stands tall over the city in Piazza del Duomo with its magnificent Renaissance dome designed by Filippo Brunelleschi. You can recognize this dome from anywhere in the city. 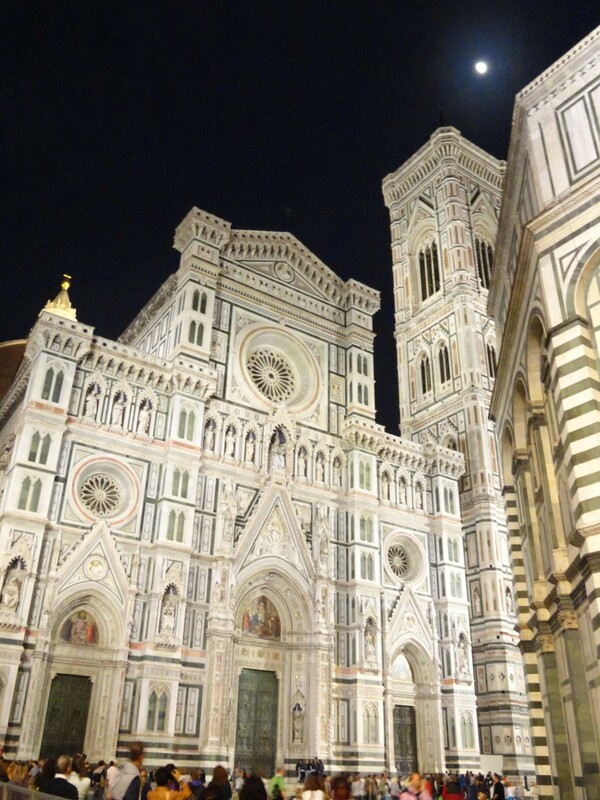 The cathedral is named in honor of Santa Maria del Fiore. 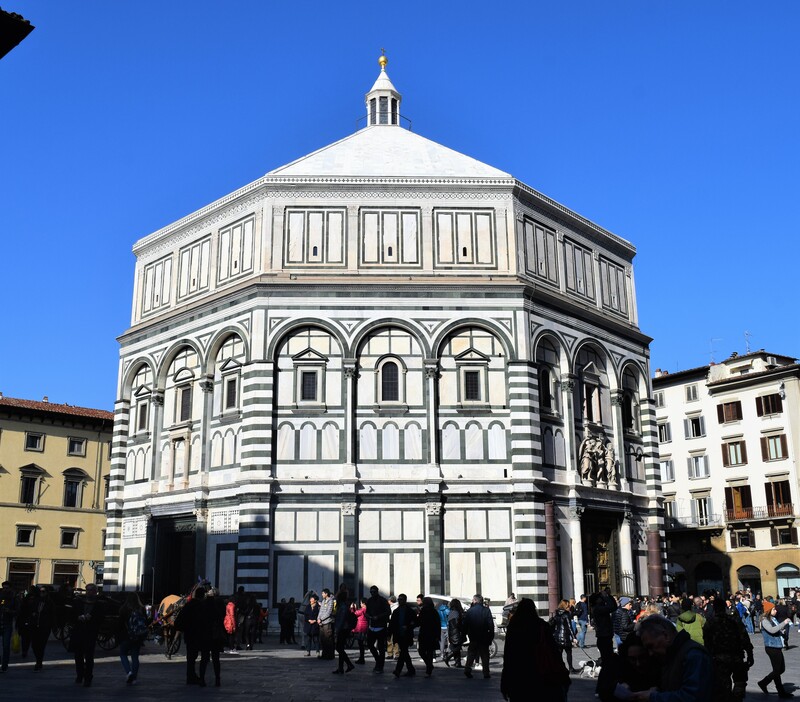 The cathedral was begun at the end of the 13th century by Arnolfo di Cambio and the dome, which dominates the exterior, was added in the 15th century. The exterior is covered in a decorative mix of pink, white and green marble. It is just amazingly beautiful! The interior is plain, cold and stark. The mosaic pavements (pictures below) are something I love to photograph. A picture of the back of the church shows a the clock above the entrance. It was designed in 1443 by Paolo Uccello in accordance with the ora italica, (where the 24th hour of the day ended at sunset) and it still works today! 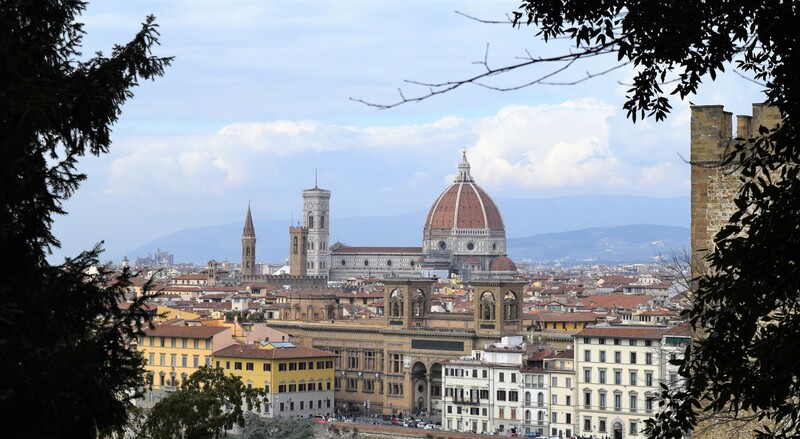 We have been very lucky to visit Florence several times. Each time, there is scaffolding somewhere around part of the exterior for cleaning. I think that by the time they go around this enormous complex, it is time to start all over again! Not sure anyone will ever have a picture without some scaffolding and screening in it. The dimensions of the building are: Building area 8,300 square metres (89,340 square feet), length 153 metres (502 feet), width 38 metres (125 feet), width at the crossing 90 metres (300 feet). The height of the arches in the aisles is 23 metres (75 feet). The height of the dome is 114.5 metres (375.7 feet). Most people are aware that the dome consists of two interconnected shells. It is actually a shell within a shell and was erected between 1418 and 1434. Filippo Brunelleschi entered his design in a competition in 1418 but was only accepted after much controversy in 1420. 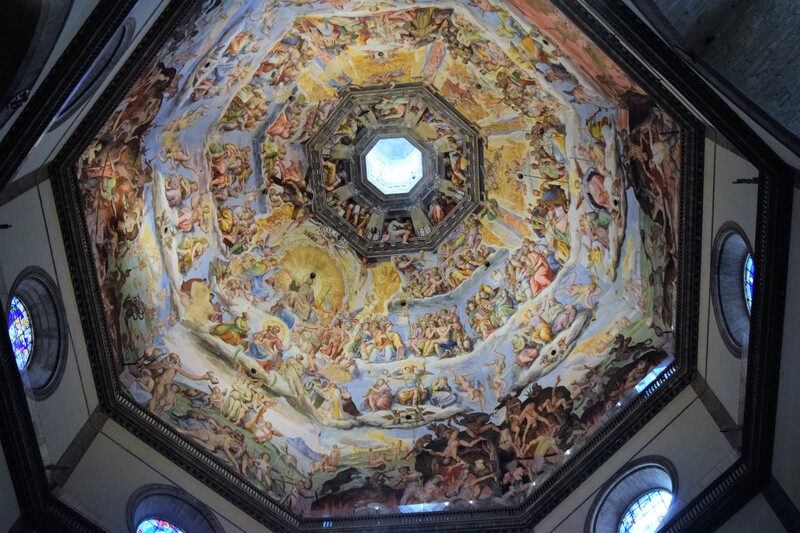 The dome is capable of withstanding lightning and earthquakes, and has a diameter of 149 feet or 45.5 meters. It remains the largest brick dome ever constructed. It is 463 steps to the top and worth every painful step; look at the views from the top! 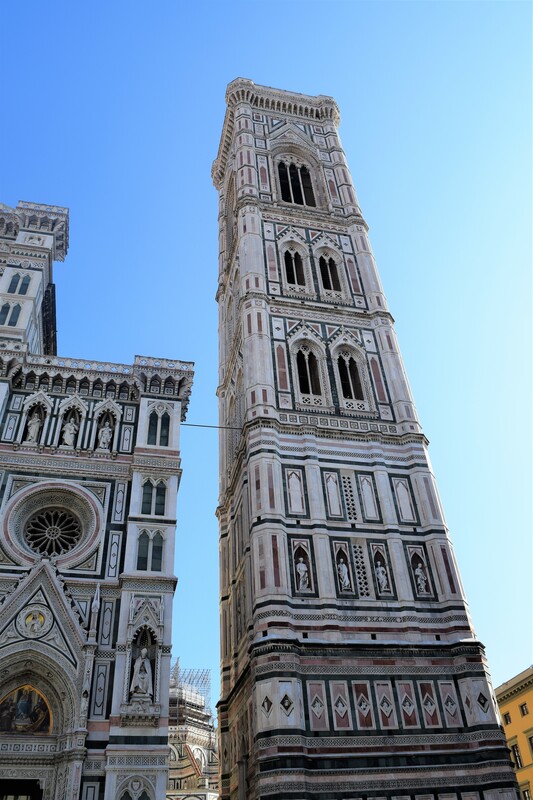 The bell tower stands 84.7 meters tall and approximately 15 meters span, it is the most eloquent example of 14th century Gothic architecture in Florence. Begun by Giotto in 1334 he only completed the first part of his bell tower (up to the hexagonal panels) before he died in 1337. It is 414 steps to the top of the viewing platform. 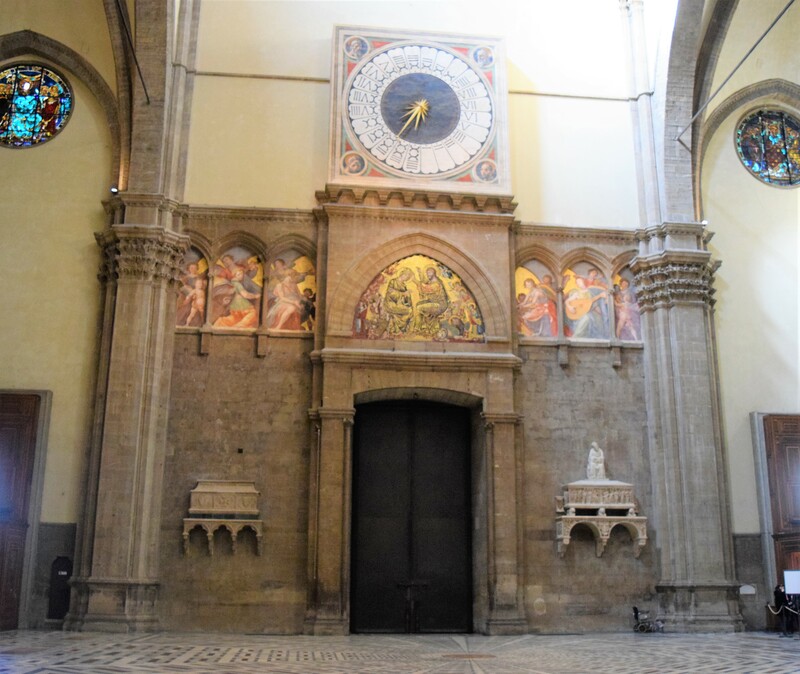 The Baptistry of San Giovanni, one of the most ancient churches in Florence and is located opposite the cathedral entrance. 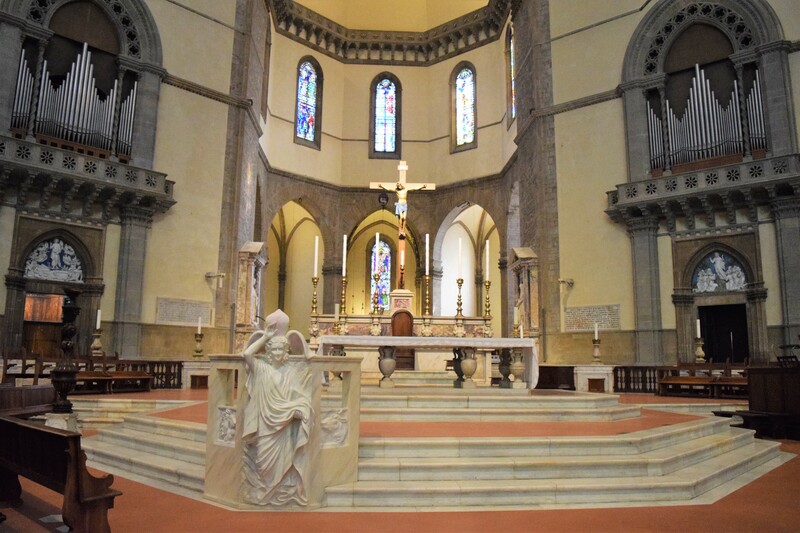 The Octagonal building is totally made of slabs of white Carrara and green Prato marble. It is covered by a dome of eight segments resting on the exterior walls.